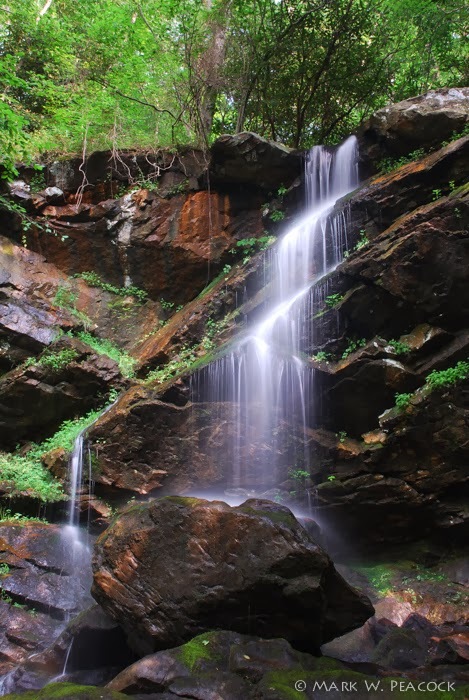 This 30' waterfall is located on private property on the western side of Buffalo Mountain in Washington County, TN. It's an easy hike (only 150 yards) from the road. Although it's private property, one website indicates that owners don't mind visitors as long as visitors respect the property and don't trash it up. 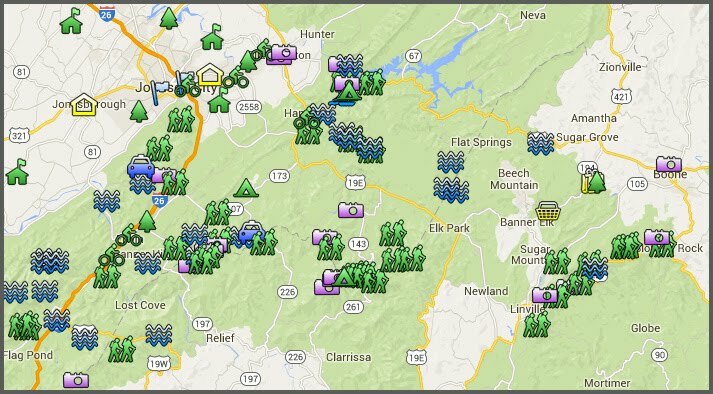 So if you visit, show your appreciation to the property owners by picking up any trash you find. To see more photos and to learn more about the waterfall, click here and here. Directions: Take I-26 to the Erwin/Jonesborough exit #37. At the end of the ramp, turn west (away from Erwin) and take State Route 81/107 west for 4.1 miles, immediately before crossing the Nolichucky River, turn right onto Arnold Road. Reset your odometer and continue for 0.9 miles to a small pull-off on the left side of the road. It's the only pull off that hasn't been blocked with large boulders. It's quite a drop-off from the road, so be careful and don't try this with a low-clearance vehicle! Walk 10 or 20 paces up the road (still heading north), then cross the road and you'll see a small, unmarked trail heading up into the woods that will lead directly to the falls. The directions herein need some updating. There is now more parking, and the parking is OK for any type of vehicle except those carrying people who litter. At the intersection of TN 107/81 and Arnold Road, travel North (Nolichucky River is on your left) 0.8 miles. On your right at 0.8 miles will be flat gravel parking for a few cars at the foot of a fire road. Park here, then walk North along Arnold Road another 0.1 miles until you hear the Milstone Creek falls. The trail is on your right just before you pass the creek. Beautiful falls. Easy hike. Thanks to the owners for sharing this beautiful work of art.